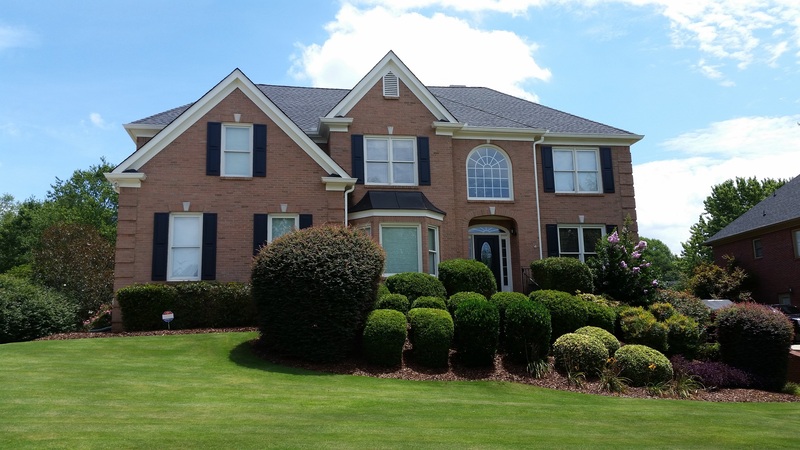 Exterior Shutters can really make or break the exterior of your home and plays a vital role in the overall curb appeal. One of the items to consider is the STYLE of shutter that will look good on your home and give that final touch to complete the picture. Dupbel Millworks Inc. is set up to create unique custom styles while offering a variety of standard styles to choose from. Let’s discuss some of the standard styles most commonly used. A shutter typically composed of three to five vertical boards that are connected using two or three horizontal battens. These shutters inspire a country or cottage look and have grown in popularity in the last few years. The latest trend is to have multiple narrow boards to create a cleaner, more sophisticated look. This style lends itself to adding additional interest by adding diagonal pieces or even strap hinges. This traditional style consists of panels within a frame. This shutter style’s popularity during the last number of decades has firmly entrenched it as the “traditional look.” Especially with the panels you can select a number of styles based on your preference. We can start off with a Flat panel, giving a very smooth and minimalistic look. 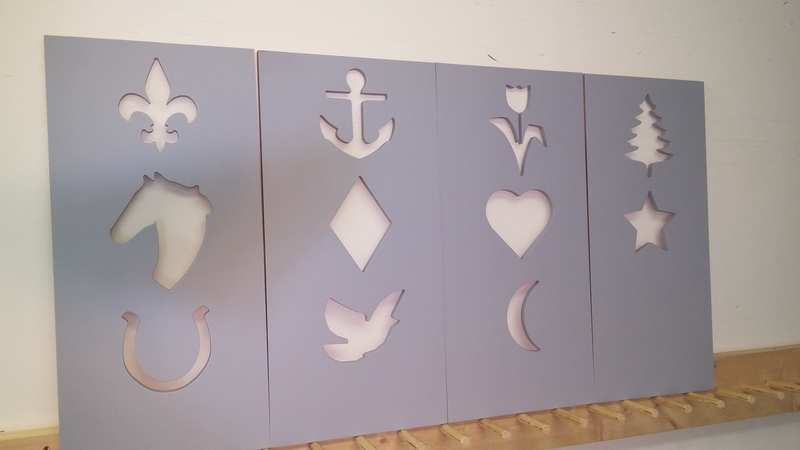 Or you can do the very traditional Raised panel, providing a more three-dimensional appearance. Our Shaker Raised panels gives you even more depth while keeping it very classic and stylish. The Mission style panel is another option, where it is incorporating design elements from the Board and Batten style, but with a much more sophisticated look. The size and placement of the panels will typically follow the window design, but lately we’ve seen a lot of deviation from the traditional to jazz it up a little bit. We can incorporate a small panel in the center, make them single panels, or even 3 equal panels, all depending on the look the home owner wants to create. 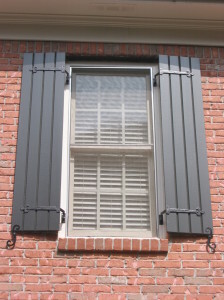 Louvered styled shutters are the original “classic standard,” found on period buildings such as Antebellum, Colonial, Williamsburg, Georgian and Federal styled houses. Louvered shutters create an additional architectural element to enhance the house’s façade. Louvered shutters can also be the right choice for Contemporary styled buildings wishing to create a more traditional appearance. For a slightly more modern look you can make the slats wider to give a cleaner, less busy appearance. Dupbel Millworks Inc. manufactures exteriors shutters using only weather resistant materials. This is especially important in Georgia’s hot, humid conditions. We have a series of standard shutters styles, while fully equipped to help you design a custom style specifically for your house. We are a full service company, and can help you from the design phase to installation. Exterior Shutters plays an important part in the overall look and feel of your home. Let’s explore some of the popular trends we see for 2018. Try using simple shutters for a pure, uncluttered effect to allow other beautiful features on the outside of your home to shine. It is in line with minimalism, where you incorporate clean, refreshing looks, while adding a nice touch to your decor. To follow this trend, use shutters with sharp lines, minimal details and neutral colors. Here we will propose something like a flat panel shutter, and/or a shutter with one large single panel, or even a board and batten style with no battens (horizontal pieces). Color plays a big role in the overall appearance of your home, and while exterior shutters are typically dark colored, we’ve seen an uptick in lighter colored shutters. This works especially well when trying to modernize the look of an older building. Light colored walls, combined with shutters in a slightly darker hue seems to be the norm. Whites and grays works very well and is a trend that will be with us for a while. Exterior shutters should never overpower the look of your house and not all homes lend itself to the exotic. There’s nothing wrong with some traditional Raised Panel style shutters or even Louvered shutters to give a traditional, formal house a neat and tidy look. Board and Batten shutters works well on a house with a mix of exterior surfaces (brick and stone, or siding and shingles). For Raised Panel style shutters, make sure the panels mimic the windows, for Louvers you can try a wider slat, and with Board and Batten shutters we see a trend to use more, but narrower Boards (vertical pieces). Another subtle way of giving you home a one-of-a-kind appearance is to add custom cutouts to your shutters. Let your home’s personality shine with just about any shape you can imagine, from stars and crescent moons to palm trees and hearts. 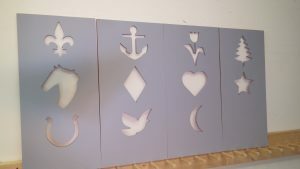 Go bold and traditional with a full cutout, or subtle and interesting with only a small relief cut on the outside corner. This obviously only works on paneled or Board and Batten style shutters. The exterior of your home is the first impression for people coming up to your house. Shutters play a crucial role in making or breaking that first impression. It makes sense to ensure you incorporate the shutters to form a pleasant and unified appearance. Dupbel Millworks Inc. manufactures exteriors shutters using only weather resistant materials. Our core business is shutters made from a composite wood material that is rot, insect and weather resistant. We manufacture a series of shutters styles and are fully equipped to help you design the specific look you desire, and every shutter is custom made based on your house, windows and design. One of the easiest but often overlooked enhancement to a house to improve the curb appeal is to add or update your exterior shutters. Historically exterior shutters served a purpose by offering light control, ventilation and protection from the elements. Today exterior shutters are mostly decorative. Dupbel Millworks Inc. is set up to create unique custom styles while offering a variety of standard styles to choose from. A shutter composed of three to five vertical boards that are connected using two or three horizontal battens. These shutters inspire a country or cottage look and have grown in popularity in the last few years. The latest trend is to have multiple narrow boards to create a cleaner, more sophisticated look. A Raised Panel shutter is made of panels that fit into a frame. The panels have raised sides to create depth and interest. Raised Panel styled shutters are the new “traditional” over louvered. Found on many Colonial, Georgian, Federal, or Manor style homes with brick or siding being the primary face material. Raised Panel shutters on homes of this type create a classic appearance. 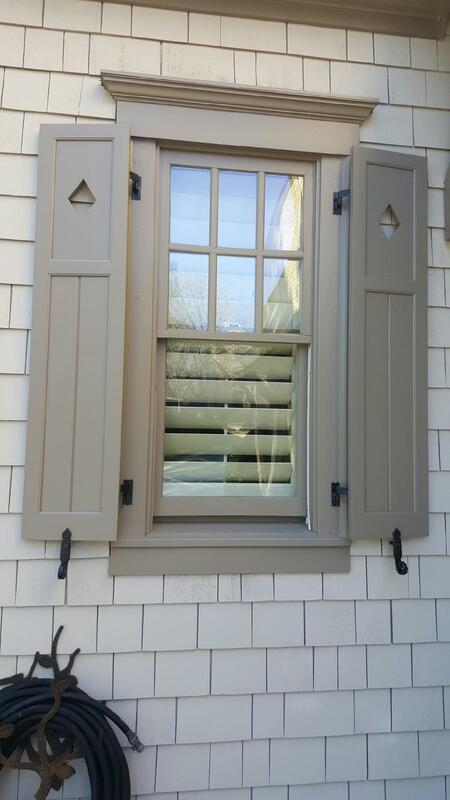 The shutter style’s popularity during the last number of decades has firmly entrenched the raised panel style as the “traditional look.” The solid three dimensional characteristics of the raised panel shutters provide a substantial presence on homes. Shaker Raised shutters generate a sharp, crisp appearance versus the classical raised panel style. This shutter style acquired its name from the no frills, yet functional design standards of the Shaker religious community. The shutters rails, stiles and panels are fabricated square with no ornate profiles added. This shutter type is an excellent choice for brick or stucco faced homes where you want to ensure the lines and features of the shutters are clearly visible from a distance. Louvered styled shutters are the original “classic standard,” found on period buildings such as Antebellum, Colonial, Williamsburg, Georgian and Federal styled houses. Louvered shutters create an additional architectural element to enhance the house’s façade. Louvered shutters can also be the right choice for Contemporary styled buildings wishing to create a more traditional appearance. A combination of a Board and Batten shutter and a paneled design, providing a fresh approach to exterior shutters. The clean, well defined vertical lines will compliment your house and windows, while breaking the monotonous horizontal lines that you get on a traditional brick or siding house. Definitely something to consider if you don’t like the robust look of a Board and Batten shutter, but were put off by the sometimes “flat” look of a Raised Panel. The Mission Panel style provides a very elegant look, breaking away from traditional shutter designs. Size: One of the biggest mistakes people make with shutters is the size. It is important that the shutters are sized correctly for your windows, while taking into account the features of the house, obstacles that could be present, and the look you are trying to achieve. Your shutters are going to be mostly decorative, but make sure they are sized as if they would be functional and as if they belong there. 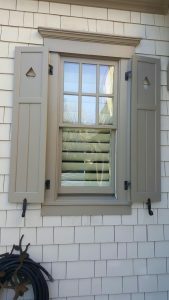 Hardware: Traditionally shutters were attached to the window frames with hinges. 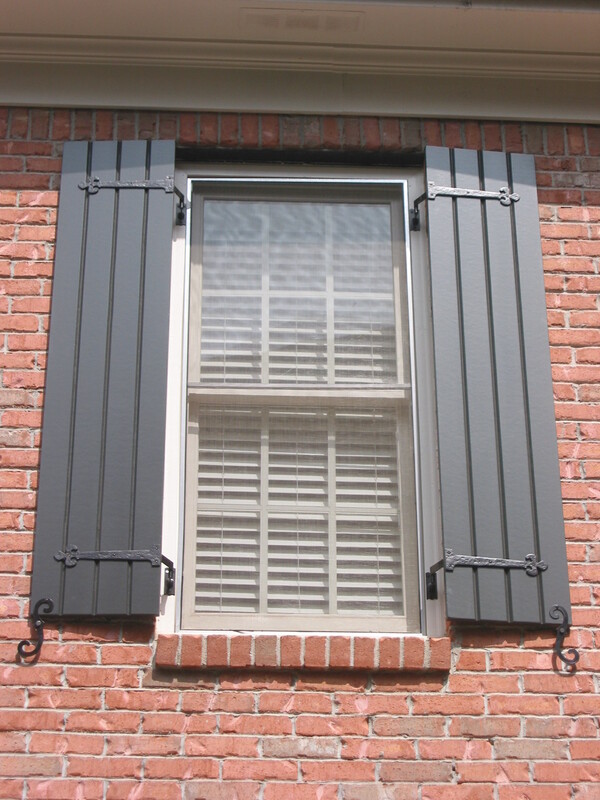 Today hardware plays an important role in the appearance of your shutters. Options will vary depending on the type of siding and the windows. Adding hardware adds to the curb appeal and the authentic look. It also put the shutter at a slight angle, adding visual interest and creating better shadow lines that brings out the design features of the shutter style. Installation: Whether you or a pro handles the installation, make sure there is a suitable mounting surface and that the window frames are in good shape. Installation prices are in addition to the price of shutters and hardware. Dupbel Millworks Inc. manufactures exteriors shutters using only weather resistant materials. Our core business is shutters made from a composite wood material that is rot, insect and weather resistant. This is especially important in Georgia’s hot, humid conditions. Although we carry a series of shutters styles, we are fully equipped to help you design the specific look you desire, and every shutters is custom made based on your house, windows and design.